Leonard Baskin, who first gained recognition for his monumental woodcuts in the 1950s, enjoyed an artistic career that spanned the better part of the twentieth century and encompassed major accomplishments as a sculptor, printmaker, illustrator and book-maker. This admirable plurality of talents has, however, made it difficult for the public to get a cohesive sense of Baskin’s artistic achievement. Not only did he pursue a multiplicity of art forms with equal dedication and vigor, but he also created discrete cycles and series that tended to be exhibited or published as self-contained units. A sculpture demonstration at Macy's proved a turning point for Baskin when he was fourteen years old. The boy returned home with five pounds of plasticine clay and the notion that he would become a sculptor. Over the course of his decades-long career, Baskin would earn the distinction he sought as a teenager. Numbered among his works are sculpture commissions for the Franklin Delano Roosevelt Memorial in Washington, D.C., and the Holocaust Memorial in Ann Arbor, Michigan. However, concurrent accomplishments as a printmaker, typographer and printer complicate the task of assigning Baskin to any one neatly-defined niche. Each of Baskin's works reveals an artist in possession of enormous visual and literary vocabularies. The pluralistic nature of his abilities is echoed in wide-ranging (and often recurring) subjects. Baskin's attraction to Old Testament themes perhaps comes as no surprise, considering that he was the son of an orthodox rabbi. However, Greek mythological personages, predatory birds, Native Americans and figures of death and the dead also number among Baskin's considerable cast of characters. Social consciousness and a high regard for humanity connect the numerous and apparently diverse artworks that comprise Baskin's oeuvre. 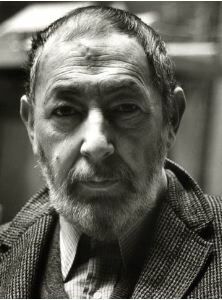 The second of Rabbi Samuel and wife May Guss Baskin's three children, Leonard Baskin was born in New Brunswick, New Jersey, on August 15, 1922. The family relocated to Brooklyn, New York, when Leonard was seven years of age. From this time, he studied at yeshiva, until his father permitted him to transfer to a public high school at age sixteen. After becoming enamored of sculpture, Baskin took on extracurricular artistic studies at Manhattan's Educational Alliance under Maurice Glickman, who arranged the boy's first exhibition in 1939. Baskin attended the Yale University School of Fine Arts on scholarship. While at Yale, he began printing and founded The Gehenna Press, which over the course of his lifetime issued over a hundred finely printed books of textual and artistic importance. Following three years of service in the United States Navy, Baskin traveled to France and Italy to study art under the GI Bill. In the 1950s, he began to receive recognition for his monumental woodcuts, the first of their size executed by any modern artist. Between 1953 and 1974, Baskin taught art at Smith College in Northampton, Massachusetts. It was here, in 1958, that he made the acquaintance of British poet Ted Hughes, with whom he forged a lifelong friendship and collaborated on some thirty books. In 1974, the artist moved with his family to Lurley, in Devon, England, which brought him into closer proximity to Hughes. The two had a special creative synergy: image-inspired poem, and poem-inspired image. In 1983, Baskin returned with his family to the United States, and he became a Visiting Professor of Printmaking at Hampshire College in Leeds, Massachusetts. Baskin died in Northampton in 2000. Baskin was at odds with the dominant artistic trends of his time. He abhorred Abstract Expressionism, the devaluation of figural humanism and the practice of specialization. As a lecturer, writer, and public figure, Baskin verbalized his contrarian opinions, consciously separating himself from those who differed with his beliefs, yet never alienating himself from a sizable devoted public.